The Twelfth Meeting of the Conference of the Parties to the Convention on the Conservation of Migratory Species of Wild Animals (CMS COP12) will be held in Manila, at the kind invitation of the Government of the Philippines, from 23 to 28 October 2017. The provisional agenda for the Conference can be accessed here. Agenda item 24 “Conservation Issues”, and especially 24.2 “Aquatic Species” and 24.4 “Crosscutting Conservation Issues” contain many relevant items for the Agreements and MOUs under CMS dealing with aquatic and marine species. The most relevant are briefly introduced here. It should be noted that many other agenda items, such as those dealing with climate change, renewable energy or connectivity, are also of interest. Details on what will be discussed at CMS COP12 can be found on the CMS website, where following COP12 also the final resolutions and decisions will become available. This document consolidates two Recommendations on marine turtles into a single Resolution. The consolidation highlights the disparate treatment given to Dermochelys coriacea relative to other species of marine turtles covered by the Convention. Consequently, the Secretariat has proposed a Decision to the Scientific Council requesting that it review relevant scientific information to determine whether the consolidated resolution should be revised. The draft Decision is included in Annex 3.
develop recommendations relating to management of sky-glow and direct light-pollution at marine turtle nesting sites. Important Marine Mammal Areas (IMMAs) are defined as ‘discrete portions of habitat, important to marine mammal species, that have the potential to be delineated and managed for conservation’. They are an advisory, expert-based classification applied to the world’s oceans, coastal waters and shorelines, and relevant inland water bodies, consisting of areas that may merit area-based protection and/or monitoring for marine mammals. Four criteria for the identification of IMMAs were developed by the IUCN Task Force on marine mammal protected areas. They are being applied on a regional basis to cover the world’s oceans and seas. The document contains a Draft Resolution (Annex 1) endorsing the IMMA criteria and selection process and requesting support for it, and Draft Decisions (Annex 3) addressing collaboration between the CMS Scientific Council and Secretariat and the IUCN Joint SSC/WCPA Marine Mammal Protected Areas Task Force. Doc.24.2.1/Add.1 contains the supportive comments of the 2nd Meeting of the Sessional Committee of the CMS Scientific Council. CMS COP9 in 2008 and COP10 in 2011 adopted Resolutions on Underwater Noise, recognizing it as a serious threat to marine species. While initial focus of scientific and policy interest was mainly on effects of noise on cetaceans, by now it has become evident that a range of CMS-listed species, species covered by CMS Agreements and MOUs, and their prey species are affected by marine noise. Resolutions of ASCOBANS, ACCOBAMS and CMS call for noise-related considerations to be taken into account as early as the planning stages of activities, especially by making effective use of Environmental Impact Assessments (EIA). To assist with this, thanks to funding kindly provided for this purpose by the Principality of Monaco, CMS commissioned the development of draft guidelines on using EIAs to assess the impacts of anthropogenic marine noise on CMS-listed species and their prey. The Guidelines contained in the draft resolution are designed to provide regulators with tailored advice presenting Best Available Techniques (BAT) and Best Environmental Practice (BEP) to apply in domestic jurisdictions. They are provided in modular format to enable regulators to apply specific information of relevance to their jurisdiction. Their overall aim is to ensure that decision-makers are presented with sufficient information to make an informed decision about impacts. Doc. 24.2.2 contains a consolidated and updated Draft Resolution (Annex 1) which adopts the Guidelines (Annex 2), and Draft Decisions (Annex 3) focusing mainly on collaboration on this important issue. Doc.24.2.2/Add.1 contains the supportive comments of the 2nd Meeting of the Sessional Committee of the CMS Scientific Council. At the 1st Meeting of the Sessional Committee of the CMS Scientific Council, the Aquatic Mammals Working Group (AMWG) brought the issue of “aquatic bushmeat” to the attention of the Council. For COP12, under the lead of the AMWG, an expanded report on the state of knowledge regarding the harvest of aquatic wild meat was prepared (Annex 1). A Draft Resolution (Annex 2) seeks to give recognition to this topic, which unlike its terrestrial counterpart “bushmeat” has not yet been the focus of international policy efforts. It also requests the Scientific Council to establish a thematic working group dealing with Aquatic Wild Meat, the tasks of which are detailed in the Draft Decisions (Annex 3). Doc.24.2.3/Add.1 contains the supportive comments of the 2nd Meeting of the Sessional Committee of the CMS Scientific Council. CMS COP11 adopted Res.11.22 on this topic, which calls upon Parties to develop and/or implement national legislation prohibiting the live capture of cetaceans for commercial purposes, and urges Parties to consider taking stricter domestic measures in line with CITES Article XIV with regard to the import and international transit of live cetaceans. The CMS Secretariat, with funding kindly provided by the Principality of Monaco, developed draft Best Practice Guidelines to assist Parties with implementation of this Resolution. The document contains a comprehensive report on the legal situation (Annex 1), a Draft Resolution (Annex 2) amended to adopt the Guidelines, and Draft Decisions (Annex 3). Doc.24.2.4/Add.1 contains the supportive comments of the 2nd Meeting of the Sessional Committee of the CMS Scientific Council. The 1st Meeting of the Sessional Committee of the CMS Scientific Council requested the AMWG to provide a briefing paper on the impacts of recreational in-water interaction with aquatic mammals, often called “swim-with” activities, to ScC-SC2 and to make recommendations to COP12 on how CMS could address this growing concern. The report (Annex 1) concludes that “swim-with programmes” are a fast-growing phenomenon worldwide and are likely to bring widespread disturbance to aquatic mammals, with potentially serious conservation consequences. Sustainable regulation and management is required quickly before unsustainable practices become firmly established in many places. 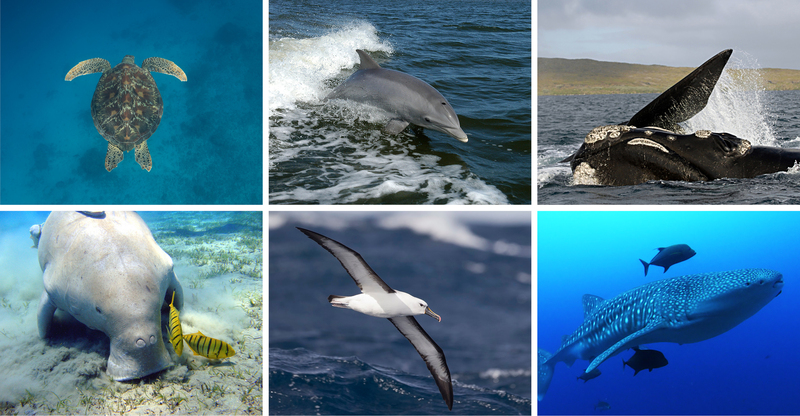 The Draft Resolution (Annex 2) gives recognition to this threat to aquatic mammals, urges the adoption of appropriate national measures to regulate such activities, and calls for research on effects and significance of these disturbances. The Draft Decisions (Annex 3), among other things, request the Council to develop guidelines and recommended code of conduct for operators. Doc.24.2.5/Add.1 contains the supportive comments of the 2nd Meeting of the Sessional Committee of the CMS Scientific Council. More than 51 cetacean species occur in the South Atlantic; of them, all large whale species were exploited by commercial whaling in the 20th century. While whales are protected by national laws and enforcement measures in the South Atlantic Range States, as well as in the Southern Ocean Sanctuary, especially the highly migratory baleen whales feeding in Antarctic waters, and breeding in tropical and temperate waters remain highly vulnerable during their migration through waters outside national jurisdiction. The document, submitted by the government of Brazil, contains a draft resolution (Annex 1), recognising the threats of cetaceans in the South Atlantic Ocean, adopting the Action Plan contained in Annex 3, and encouraging Parties and non-Parties to strengthen capacities for cetacean conservation. The Draft Decisions (Annex 2), request the support of the Secretariat for capacity-building. Over its 10-year duration, the Action Plan for the Protection and Conservation of South Atlantic Whales (Annex 3) aims to achieve protection during vulnerable phases of the whales’ life cycles and of important habitat. It covers the entire South Atlantic region, from Brazil to Chile to South Africa to Gabon. Doc.24.2.6/Add.1 contains the supportive comments of the 2nd Meeting of the Sessional Committee of the CMS Scientific Council. The largest component of marine debris is plastic, making up over three quarters of total quantities. The two major risks for marine species associated with macroplastics are entanglement in and ingestion of marine debris. An estimated ten per cent of global marine litter is “ghost gear” or abandoned, lost or otherwise discarded fishing gear (ALDFG). Microplastics are generally defined as items smaller than 5mm. They are of concern because they act as a ‘sponges’ removing and concentrating contaminants from the water, leading to bioaccumulation in the food chain. The Draft Resolution contained in Annex 1 of the document consolidates the two existing CMS Resolutions on the topic, updates the text and brings it in line with UNEA Resolution 2/11 on Marine Plastic Litter and Microplastics (2016). Doc.24.4.1/Add.1 contains the supportive comments of the 2nd Meeting of the Sessional Committee of the CMS Scientific Council. CMS Resolution 11.23 requested the Scientific Council to establish an intersessional expert working group to address the conservation implications of culture and social complexity, with a focus on, but not limited to, cetaceans. This Expert Group was established in June 2015, and its second report is presented in Annex 1. The report also contains recommendations for further work on this subject, which are presented in the draft Decision in Annex 2. Doc.24.4.3/ Add.1 contains the supportive comments of the 2nd Meeting of the Sessional Committee of the CMS Scientific Council. Bycatch is the incidental capture of a non-target species in fisheries and is a universal phenomenon. While is not the only threat to aquatic species listed by CMS and covered by its Agreements, for many species or populations it remains the most severe. Addressing it effectively requires collaboration between all relevant stakeholders, and significant improvements in monitoring and mitigation. Doc.24.4.4/Add.1 contains the supportive comments of the 2nd Meeting of the Sessional Committee of the CMS Scientific Council. The guidelines do not cover in-water interactions, such as “swim-with” or “dive-with” activities. Regarding cetacean watching, CMS is collaborating with the International Whaling Commission, which is taking the lead in the development of a joint IWC-CMS Whale Watching Handbook. Doc.24.4.5/Add.1 contains the supportive comments of the 2nd Meeting of the Sessional Committee of the CMS Scientific Council. CMS Resolution 11.25 on Ecological Networks called upon Parties to develop transboundary area-based conservation measures including protected area and other area systems, to be able to conserve species and habitat. Currently, the marine and coastal biodiversity in the East and Southeast Asia region are facing complex threats, such as sea level rise, over-exploitation and pollution. The government of the Philippines submitted a draft resolution to propose the development and management of MPA Networks within the ASEAN Region, in order to improve marine biodiversity conservation of coastal and marine ecosystems. The draft Resolution highlights the need for strengthened representation and connectivity of marine conservation areas to manage transboundary populations of CMS-listed species, and promotes the development of measures and protected areas across the ASEAN Region. Doc.24.4.9/Add.1 contains the supportive comments of the 2nd Meeting of the Sessional Committee of the CMS Scientific Council.